I thought I’d make a post today about something that every chiropractor or business owner can do to help themselves scale to the top of Google quickly. This effective chiropractic internet marketing strategy is accomplished by setting up a Google local business listing (also called Google Maps listing) and implementing the proven methods below to get better rankings in your local city search results versus the competition. If you don’t already have a local business listing, then go HERE to set one up immediately. Also, you’ll need to make sure you have a gmail account in order to get the ball rolling. If you have a look at the screenshot underneath this paragraph, you’ll notice 7 chiropractic business listings below the “sponsored links” section with a local map of the area to the right. I keyed-in “Los Angeles Chiropractor” so you could see the example. The results that surface are prime internet real estate opportunities for massive exposure if you know how to strategically position yourself correctly make other potential New Patients / clients choose you. 1. Having Multiple Reviews – Let me just say that these should be from real customers. You can never have too many reviews so focus on getting 1 per day from previous, happy patients / clients. You want to have a grossly disproportionate amount of reviews compared to your local competition. That means if the other guy has 5, you want to have 50! This alone will create massive social proof in your potential customers eyes. It’s in your best interest not to fake the reviews either as that can be detected fast. If you’ve ever purchased a book on Amazon.com, what’s the first thing you do? YOU LOOK AT THE REVIEWS! 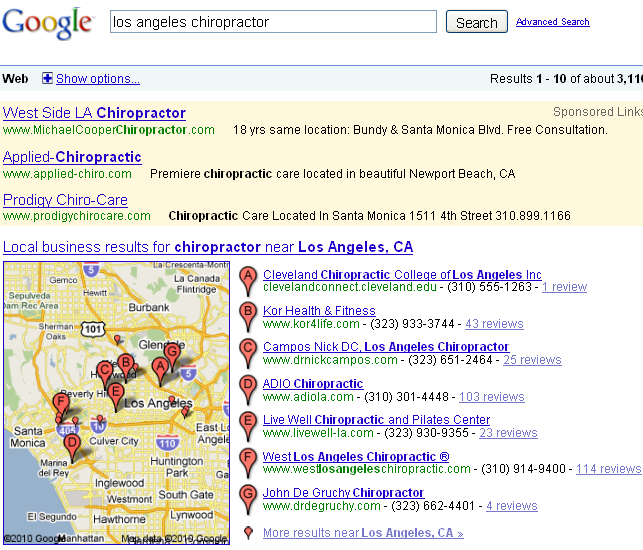 Regular people searching online looking for chiropractors and other professionals do the same exact thing. It’s no secret people trust businesses / products with tons of 4-5 star reviews so go get-em! 2. Adding Photos and Videos – You’ll want to incorporate as many photos / YouTube videos as you are able to along with making sure you’re company logo is included. Have photos from the office and maybe a couple from personal travels to show you’re more than just a doctor / professional. Your videos can offer simple health tips that onlookers can implement today to better their quality of life. 3. Incorporate Keywords in the Business Description – Google provides a special section where you’re able to describe what your company offers so choose your wording wisely, as this is used to place you in the appropriate search categories as internet users surf online. 4. Incorporate Keywords in the Business Name – I don’t recommend changing your business name, but if your keywords are in the extended business name or LLC, definitely make sure this is the company name in which you register the profile. Keywords are very important, as the same point I just mentioned from #3 applies here, too. 5. Add a Company Coupon – In case you were unaware, Google allows printable coupons you can upload to your business listing. Provide an overwhelming amount of value and make the offer for a limited time so the potential customer will feel more compelled to act. 6. Build back-links to the listing – Create a link from your website homepage, your videos, articles, online forums, blogs or press releases to this Google business listing. It will give it more “juice” and push it higher and higher in the online maps rankings. If you do exactly what I’m mentioning to you above, your Google Local Business listing will have the best chance at attaining a top 10 ranking, many times snatching the #1 spot from your local competitor. Not to mention it’s going to build rapid social proof and credibility once people in the community begin to see you at the top with boatloads of great reviews! Go ahead and leave a comment below and tell me what you thought about this post! Great article Matthew. You should discuss the benefit of citations in increasing Google local business rankings. My blog on my website has an article on this. Please feel free to use it. I completely agree with you regarding your comments and citations would go right along with your list as a 7th item. Certainly local business listings is a good business marketing tool to reach the local consumers. Probably the first time the Internet is going to benefit the local business. What I am most concerned about are small and local businesses having to contend with multiple websites when it comes to their local listing. What I’m really talking about are “time resources”. Afterall, there are over 60 websites in four different categories specifically geared towards local listings. How can a local or small business have the time resources to cover this space. Even if you made a conscious decision to not manage all 60, there are well more than Google, Yahoo, Bing, and Ask. The space goes to Local.com (they went public), Yelp, Merchant Circle, and many others. Consumers will be the ones deciding which of these local listing websites they will go and post their experience through consumer reviews. This adds to the burden that no one single local listing website will do the trick. Therefore, my argument is that “getting listed” is not the real services needed. The local business still has to claim, update and maintain their local listing at multiple local listing websites. “Getting listed” is an admirable starting point, but it will not address the long term need of the local business and their local marketing efforts. Good information from your post and hopefully varying opinions help give perspective. How would you explain these guys who haven’t even claimed their listing yet, being #2? Great information as always, I think Jack mentioned it but citations also help. But make sure for the citations that the Name and address is exactly the same as your google local address for all of your citations. To find directories to create a citation for your listing click on on your competitors information to view where there citations are coming from and go to those sites and add your business to the directory. Great information, Dr. Loop! And, very easy to understand. If chiropractors would incorporate this one tip in addition to having a strong online presence, they’ll have a greater opportunity to connect with their community than the competitors. Funny, I was just thinking about this very topic. How timely this post was. The universe works in mysterious ways. Great post! I think there is only so much you can do to optimize your listing in Google’s Local Business section which has changed from displaying 10 to now 7. 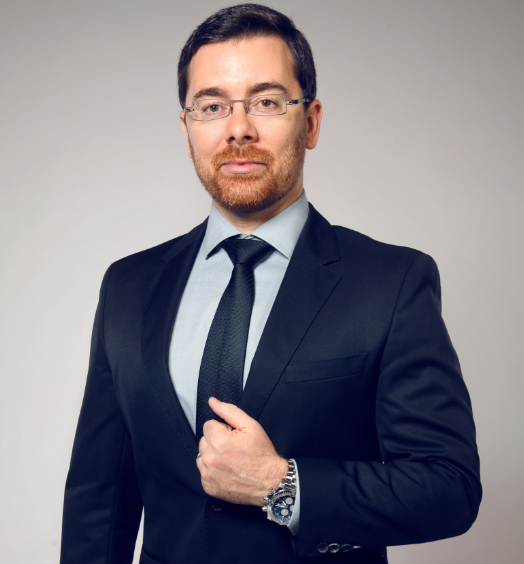 Although you give great advice on the 6 likely elements of GLB algorithm, there seems to be no sure way to get your listing to the number 1 position. I read on some blogs that proximity to location is the deciding factor… who really knows, but Google. With that said, I do agree that businesses should claim their listing and get their patients to write positive reviews. Thanks again. And good post Todd! Interesting information. We have done everything short of having 50 reviews and the coupon and our google listing is on page three where it has been for ages!!! We have more reviews than any of our competitors, however we do not have a coupon up and running at this stage. Interestingly we were told only to have one listing, some of our competitors have five listings which all show much earlier than ours, so not sure what google is up to!! I can attest that adding the reviews made all the difference in the world for us. I did the strategies and now my business listing is on the first page. Mission accomplished. Thanks for the post! Seems like great advice. I do have a local profile but haven’t done much to improve it. Will give it a shot and let you know how it works. Make sure you also use Google’s Tag service where you can highlight your map listing with a coupon as Dr. Matt mentioned, or even a video. Don’t forget these listing allow you to list upload 10 photos and a few videos. So the more you have the better. Super article. With local search becoming the leader for small and local businesses this information worked out great for me to brush up on a few thoughts. I provide local search consulting to medical and psychological field practitioners who are still trying to do it themselves instead of hiring a certified consultant. I appreciate your advice. I have been trying to improve my listing and had not thought of add back links to my Google listing. Do alt tags in your pictures help? I love how easy to read this article is. Thanks Matt. I’m going to take action immediately. Matt, what’s the easiest way I can ask patients to write me a review? I would like to send people an email but I’d like to keep the amount of work, like navigating around a site, down to a minimum. Go to the map view of your local map listing and look on the upper right corner of the page and you will see a LINK MENU. Once you’re there, copy that link and paste it on the email that you’ll be sending to your customers. In that way,your customers will be one click away from posting a review to your map. A lot tried SEO ( Search Engine Optimization Technique) in order to get high rank in Google.. I am really glad that I found this blog.